We offer many light plant configurations to cover your lighting and power needs: 8, 20, 40, 60, and 100 KW light plants. 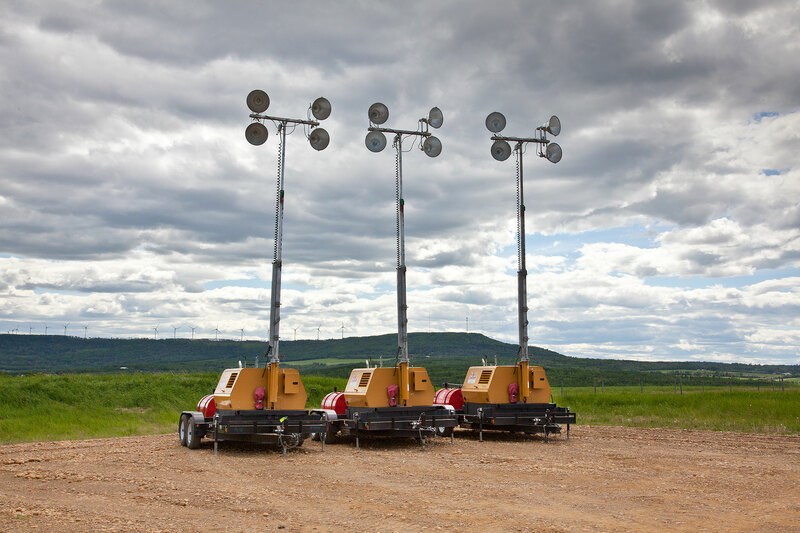 All units have light masts and power distribution. We have many different sizes and options for power generation and distribution, with many different sizes of fuel tanks. Please call us with your site specific needs to find a solution that’s right for you. 100% more light while burning 35% less fuel! Our brand new Gen 2 Hercules Stadium Lights are unlike anything you have ever seen! Debuted at the 2018 Global Petroleum Show in Calgary, these CSA approved units boast 24 high intensity LED lights (vs. 16 metal Halides in the older style units), yielding 100% more light, projected farther and brighter than any other stadium light on the market. In addition, these units burn 35% less fuel, lowering both fuel cost and carbon footprint per site. A 7 day run time reduces refueling frequency and cost. As our clients continue to work towards enhancing worker safety for 24 hour operations, we see many more frac sites include stadium lights as part of their lighting package. Run without refueling for a week! Available in 20 KW and 45 KVA configurations, these towers have dual tanks with 900 litre fuel capacity, and are delivered to your work site full of fuel. Popular in all remote work site locations, these units will run for over a week without refueling. Run 120 and 240 volt equipment & 6 lights at the same time! The Maxi-Lite II V-Series 6-Light LED is a powerful source of light for many applications where industrial work site lighting is needed. 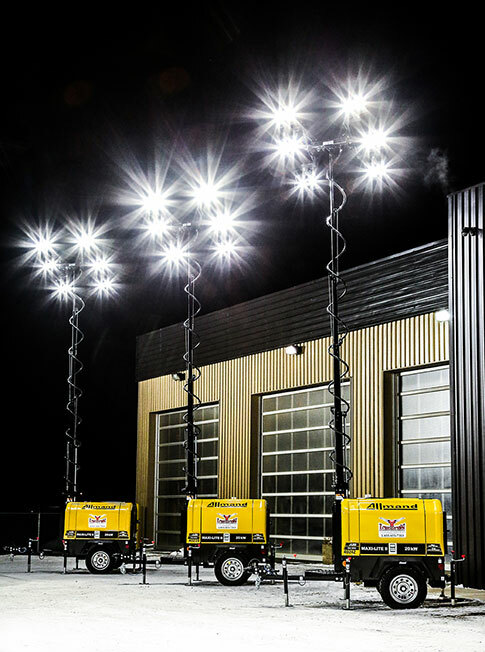 The 6-Light LED configuration produces 100% more light than a traditional light tower! The Arctic Spec 20 KW generator gives you plenty of power to spare for running additional 120 and 240 volt equipment at the same time you are running 6 lights. In our tests, we found that the Kubota D1105 engine in these machines has a fuel consumption rate of 0.45 gallons/hour when running 6 x 320W LED lights. With a 100-gallon fuel capacity, you will get 6-7 days run time without refueling. The efficiency of these CSA approved units has both environmental and cost saving benefits- lowering your fuel cost and the carbon footprint of your work site. We are located in the heart of the Montney and Kaybob plays, with shop and yard facilities in Fox Creek & Grande Prairie, AB and Dawson Creek, BC. We maintain a large fleet of surface rental equipment specifically tailored for Completions, Drilling and Facility Construction. 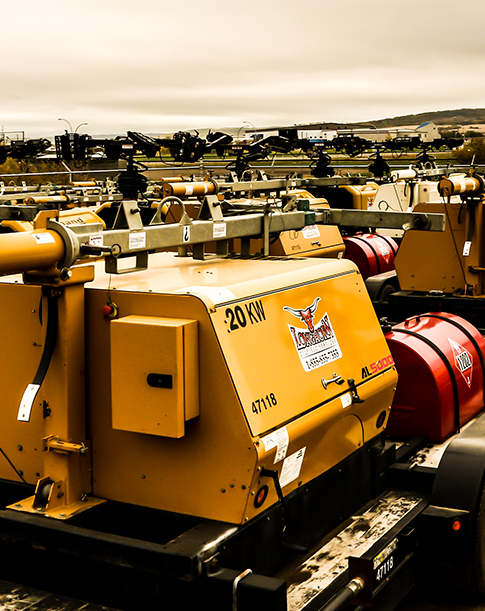 From light plants, holding tanks and office trailers to fuel skids and washroom trailers and 50-50 well site trailers, we can handle all of your oilfield rental needs.